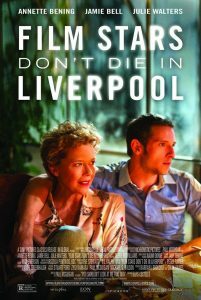 “Film Stars Don’t Die in Liverpool” (2017). Cast: Annette Bening, Jamie Bell, Julie Walters, Vanessa Redgrave, Kenneth Cranham, Stephen Graham, Frances Barber, Leanne Best. Director: Paul McGuigan. Screenplay: Matt Greenhalgh. Book: Peter Turner, Film Stars Don’t Die in Liverpool. Web site. Trailer. Fading film star Gloria Grahame (Annette Bening) takes to the stage to prop up her sagging career in the new, fact-based romantic drama, “Film Stars Don’t Die in Liverpool.” Photo by Susie Allnutt, courtesy of Sony Pictures Classics. In 1978 London, aspiring actor Peter Turner (Jamie Bell) had a passing encounter with his new neighbor, Academy Award-winning actress Gloria Grahame (Annette Bening), an aging film star who had fallen out of favor in recent years. Grahame, a vampish blonde starlet who earned a reputation for playing “bad girls,” made a name for herself as the flirtatious Violet Bick in Frank Capra’s “It’s a Wonderful Life” (1946) and won an Oscar for her performance in “The Bad and the Beautiful” (1952). However, over time, with age, fading looks and the rising popularity of screen competitors like Marilyn Monroe, Gloria’s star gradually declined. She also developed a reputation for being somewhat difficult to work with, all of which caused her to be relegated to more obscure roles. She took whatever parts she could get on stage, screen and TV, both in Europe and America. Off-screen, Gloria’s persona in many ways echoed her movie presence, and, when she met Peter, she turned on the charm with him in much the same way her characters did with their romantic prospects. Despite their vast difference in age – she was 54, he was 28 – there was an undeniable chemistry between them, a bond that quickly birthed a torrid relationship. But, as became apparent over time, the romance was driven by more than just hormones; Gloria and Peter truly were in love. Despite an age difference of 20+ years, onetime screen idol Gloria Grahame (Annette Bening, left) and aspiring actor Peter Turner (Jamie Bell, right) find love in “Film Stars Don’t Die in Liverpool.” Photo by Susie Allnutt, courtesy of Sony Pictures Classics. However, as much as Peter adored Gloria (and vice versa), the couple also had its problems. Gloria’s increasing obsession with her looks, her denial about her advancing age and her efforts at keeping a lid on secrets from her past all caused her to be capricious and temperamental. She also held on to her share of unrealistic expectations, such as a hope that she would one day be cast to play the role of Juliet in Shakespeare’s famous romantic tragedy, a disappointment waiting to happen that would assuredly lead to tantrums, pouting and despair. Peter often attempted to comfort his beloved in these situations, but he often became the unwitting target of her wrath, frustration and sarcasm. And, as new and even bigger challenges began affecting Gloria, the strain between them grew progressively worse. But, despite indications to the contrary, when the real reasons behind Gloria’s behavior became apparent, it was obvious that she loved Peter more than he or anyone knew, a fact that was buried under some odd covering and something that remained hidden until circumstances became dire. 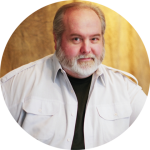 It’s unfortunate that the depth of our feelings often isn’t revealed until we find ourselves in crisis, as was the case with Peter and Gloria. Of course, it’s not realistic to expect that to change as long as we’re mired in denial about our circumstances. Having the courage to face the truth about ourselves and our emotions can help us break through such obstacles, making it possible for us to find out what it means to truly be in love – and to express it freely to those we care about. Such circumstances and attitudes are a direct outgrowth of our thoughts, beliefs and intents, the building blocks of the conscious creation process, the means by which we each manifest the reality we experience. And that existence will invariably faithfully reflect the nature of those thoughts, beliefs and intents, for better or worse, whether we like it or not. 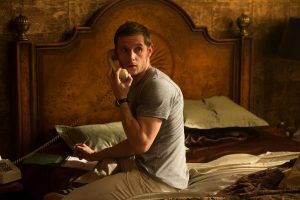 Aspiring actor Peter Turner (Jamie Bell) falls hard for a faded screen idol in the new romantic drama, “Film Stars Don’t Die in Liverpool.” Photo by Susie Allnutt, courtesy of Sony Pictures Classics. It’s hard to say if Gloria was aware of any of this, but, as the film illustrates, her reality indeed mirrored the beliefs she held. Try as she might to squelch things about herself, her life and her past, those influences lingered in the makeup of her existence, ever looming and threatening to emerge when they could no longer remain hidden under the weight of containment. But, rather than own up to them and acknowledge their presence, Gloria would generally struggle to hide or minimize them, even from those who cared about her, like her adoring Peter and his kindly parents (Julie Walters, Kenneth Cranham), who freely treated her like one of the family.  Instead of accepting the help and compassion they showed her, Gloria sometimes pushed them away in apparent acts of ingratitude. But were Gloria’s actions truly thankless? Superficially speaking, that would seem to be the case. Upon further scrutiny, however, there was more to her behavior than met the eye. Those who looked closely enough might be able to see what her real motivations were. But, to do that, onlookers would need to make use of their powers of discernment to be able to see what was truly going on. This would require them to strip away the camouflage that obscured their perceptions and perspectives, a practice that, for example, called upon them to distinguish the person from the characters she was known for playing – something that might not have been easy to do but that would reveal significant distinctions, despite the superficially similar trappings that characterized the two. Those who succeeded at this would undoubtedly see a very different picture, one depicting the real Gloria, someone who was not her screen presence, even if it often seemed that way. Making distinctions like this is a lesson we could all learn from. Failure to do so often results in misunderstandings, frequently with painful or frustrating consequences. Were we to do that, we could spare ourselves considerable hardship, enabling us to get the most out of our relationships and circumstances, unburdened by the anxiety and heartache that come from misinterpretations, a crucial consideration when we’re faced with situations in which we may not have much time to act. 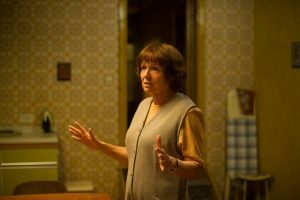 Caring, compassionate Bella Turner (Julie Walters) treats a celebrity guest in her home like one of the family in the touching, new, fact-based romance, “Film Stars Don’t Die in Liverpool.” Photo by Susie Allnutt, courtesy of Sony Pictures Classics. This vastly underrated cinematic gem definitely deserves wider attention – and far more appreciation – than it has received. With what is arguably Bening’s best screen performance, coupled with a fine counterpart lead portrayal by Bell, this heartfelt romantic tearjerker justifiably earns every bit of emotion it evokes from audiences. It also features one of the best original songs to grace the screen in ages, Elvis Costello’s fittingly moving You Shouldn’t Look at Me That Way. If you enjoy good old-fashioned love stories, go see this one, despite what the cynics might say (but keep the tissues handy). “Film Stars Don’t Die in Liverpool,” unfortunately, has not received the awards season recognition it deserves. Thankfully, though, the BAFTA Awards – the British equivalent of the Oscars – came through to help make up for this, honoring the picture with nominations for best actress (Bening), actor (Bell) and adapted screenplay. It would have been gratifying to see this offering pick up additional accolades, but at least these three nods are better than nothing (which really would have been a shame). Our time on this planet is shorter than most of us tend to realize, and it would be in our best interests to make the most of it while we have the chance, especially where love is concerned. Gloria and Peter bring that truth front and center, shining a brilliant light on it to help us appreciate its veracity and significance. Let’s hope we’re paying attention.